The desert willow tree (Chilopsis linearis) is a native Texas tree or shrub that resembles the willow but isn't actually part of the willow family. This lovely, drought resistant plant makes a fine addition to any garden where drought is a problem. It provides fragrant and beautiful flowers in conditions under which other trees and shrubs perish. The desert willow tree isn't related to the willow (Salix) family of trees. 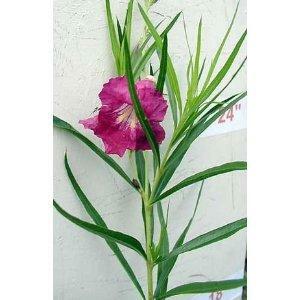 Its leaves do indeed resemble the willow, however, which led to its name, the desert willow. True willow trees need lots of water and are frequently found growing near rivers, creeks or ponds. Desert willows are the opposite, and need less than 30 inches of water per year. If they get too much water, either through rainfall or overzealous watering, they can die. The desert willow grows to about 30 feet tall. It can be shaped into either a tree or a shrub, much like the crepe myrtle that grows in the southeastern United States, with either a single or multiple trunk. The leaves are long and green and slender like a willow, which is how the desert willow got its name. The blooms are what sets the desert willow apart from many other trees and shrubs and makes it a desirable addition to the garden. Flowers appear in mid spring and the desert willow blooms throughout the summer and sometimes even into the early fall. Blossoms are typically pink or a light lilac color, but colors ranging from white to dark red have been reported. White and dark red are considered rare. The flowers have a pleasant fragrance, too. As the tree grows and pushes out new growth, new clusters of flowers appear. Desert willows need bright, full sunshine, at least six or more hours per day. As their name implies, they're desert dwellers and dislike moist roots. They need only about 8 to 14 inches of rain per year according to the New Mexico agricultural extension flier on this tree. Although these trees are hardy in zones 6 and 7, rainfall amounts in most states falling within these zones make the desert willow difficult to grow. If you do decide to try a desert willow and live in an area with average rainfall, be sure to plant them in very well drained soil. The desert willow isn't fussy about its soil and will grow in almost any type as long as it is well drained. Desert willows offer many benefits for the home garden. Their ability to withstand drought conditions makes them ideal for arid gardens where many flowers won't grow without extensive watering. In areas of the southwest, the desert willow offers color and fragrance instead of cactus spines. Hummingbirds love the flowers and frequent them for nectar. They'll also attract birds and butterflies, and one species of moth, the white winged moth, lays it eggs on this tree. Lastly, because this is a very tough tree that grows where others die, desert willows can be planted on steep, arid slopes. Tree roots prevent erosion, a very important benefit in areas prone to flash floods and erosion. Planting a stand of desert willow trees along a steep bank may prevent erosion of valuable topsoil. If you live in the southwest, you can purchase desert willows at garden centers. A mail order sources of this plant is Guzman's Greenhouse.